2 tablespoons seeds such as pumpkin seeds, sunflower seeds, mustard seeds, etc. Preheat the oven to 375°F. Boil the potatoes in salted water for 8-10 minutes. Drain, then transfer to a large roasting pan. Smash the potatoes a little bit with the bottom of a glass and place in a large bowl. Drizzle potatoes with the olive oil and toss with the turmeric and cumin seeds. Return the potatoes to the roasting pan and roast for 20–25 minutes until golden and crisp. Remove pan from oven and let potatoes cool. While potatoes are roasting, place the onion in a small bowl and add the lemon juice. Allow to marinate. Heat a dry skillet over medium heat and toast the seeds, shaking or stirring frequently until they start popping and become fragrant, about 3 minutes. Set seeds aside in a small bowl. 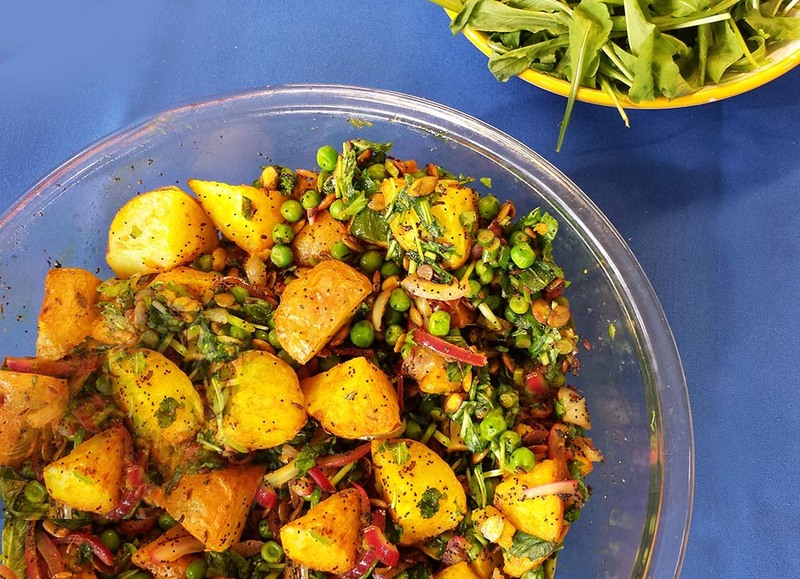 Toss the potatoes with the onions and lemon juice, herbs, peas, a splash of olive oil, salt and pepper. Serve sprinkled with the toasted seeds.